We are probably looking at the most important invention in our lifetime and a technology that will change our economy forever!! Experts are saying this is the biggest invention since the internet was created! 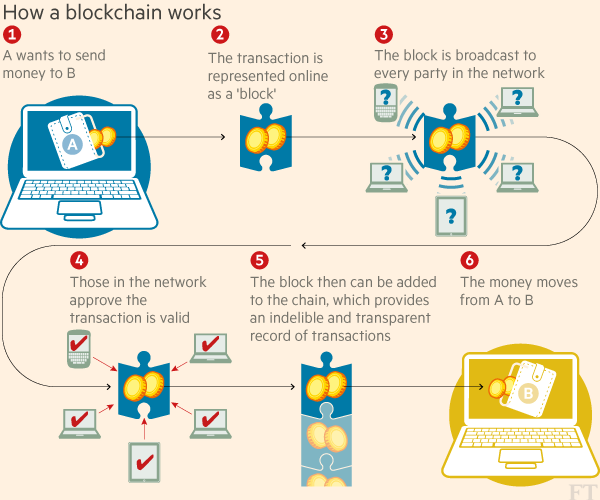 The Blockchain is a public ledger that will record and verify transactions. Just like a banking ledger that records Plus and Minuses in a book this does the same with a recorded digital transfer of ownership that gets recorded into the network. So any computer in the network has a recorded document of the digital transfer that took place. Most Blockchains follow the Bitcoin protocol and every 10 minutes the Blockchain (ledger) is updated by every computer in the system for the data or transactions will be verified accordingly. Then every computer in the network will have a copy of that verified time-stamped transactions. Each Block contains a piece of the last blocks data attached forming a chain of the transactions or the data that was entered. When every single computer has a copy of that Block, you know 100% the transfer has been recorded and the receiver will have their money, contract,loan,school results, votes what ever it maybe the value has been sent and received. You can not lie cheat or manipulate the Blockchain in anyway. Once the transaction has been verified it is irreversible. A book starts at page 1, page 2, page 3, etc., etc. So the Blockchain is like a story in a book, and every block of data is then tied to each other one block after another. This is run on a consensus based verification where the network has to verify the transaction giving 100% trust and validation. The Blockchain, in theory = ONE TRUE SOURCE OF INFORMATION. This technology is so powerful it is like having an audit company verify the books every time a transaction is made.That gives vendors security knowing that accepting the currency that any transaction is 100% verified and complete with 10 mins or faster depending on the Blockchain that is being used. The Blockchain allows no chargebacks or fraud,no more high merchant fees ever again. Transactions can now be sent instantly with low fees. We no longer need a bank system to make a transaction.We can conduct bankless transactions outside of a controlling authority. The Blockchain is the middle man. When something is so secure, to physically hack this system is cryptographically impossible you know you are in safe hands and your money is very secure. If you would want to attack the Blockchain you would have to attack every single computer at the same time and within a ten-minute window. Which is physically impossible. Making transactions far safer and secure than any bank. The Bitcoin Blockchain is 280 times stronger than all the Supercomputers combined in the USA. The effect of creating a chain of blocks from the very first Genesis Block to the current block is simply huge. Each block is guaranteed to come after the previous block chronologically because the previous block’s data would otherwise not be known. This means we cannot double spend money as the Blockchain would recognise the serial number on the coin and see that the coin has already been used and would reject that transaction. So we now have money that cannot be counterfeited cheated or manipulated in any way. The Blockchain would not allow any more coins to be created than is designed to create. Each block is also practically impossible to modify once it has entered in the chain because every block after it would also have to be regenerated. These properties are what make double-spending of CryptoCurrency very difficult. All valid transactions of the blocks are transparent, and they cannotp be modified because a block,can only reference one previous block, and is impossible for two chains to merge. It is also possible to use the Blockchain algorithm for non-financial purposes. The Blockchain is broadcast to all computers on the network that anything recorded there can be kept for safekeeping on the public ledger. This is now the safest and most secure way you could ever transact money, legal documents, loans, personal ID and much much more. Your money is now more secure and safe than any bank using the technology.!! The time is now to start learning more about this genius invention to help you get a better picture here is Don’t Tapscott who is a best selling author with the book Blockchain Revolution – explaining the Technology for you in laymen s terms. If you would like to know more please get back to us we would be happy to answer anything for you. Please like ,share and comment on this post if you get value from it. Please follow our social media channels to stay up to date with all we do. Hi there, how are you.? Let me know if there is anything you would like to know?